After our initial article from Wednesday, showing that Tuesday night’s Atlas V launch with Cygnus OA-6 had suffered a potentially serious performance hit, new information emerged allowing a more detailed look at how close Atlas V came to having a very bad day – or night, in this case. Calculations presented in this article, based on the presently known facts & public data, will show that the mission was about one second from failure. 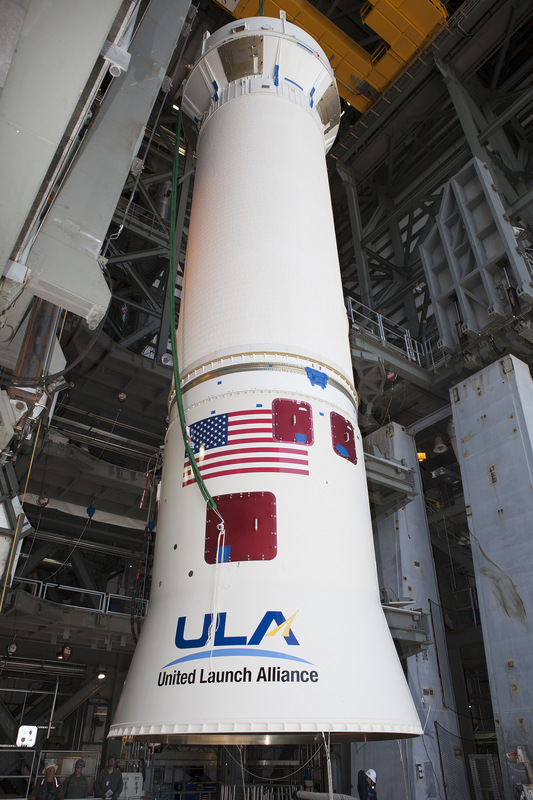 United Launch Alliance, builder and operator of the Atlas V, admitted to the problem on Thursday – confirming that the first stage shut down prematurely and the trusted Centaur Upper Stage had to make up for the performance loss by extending its burn. In an official statement sent to press on Thursday, ULA emphasized that “The Atlas V’s robust system design, software and vehicle margins enabled the successful outcome for this mission.” A closer study of margins is warranted to get an idea of how close things ended up being. 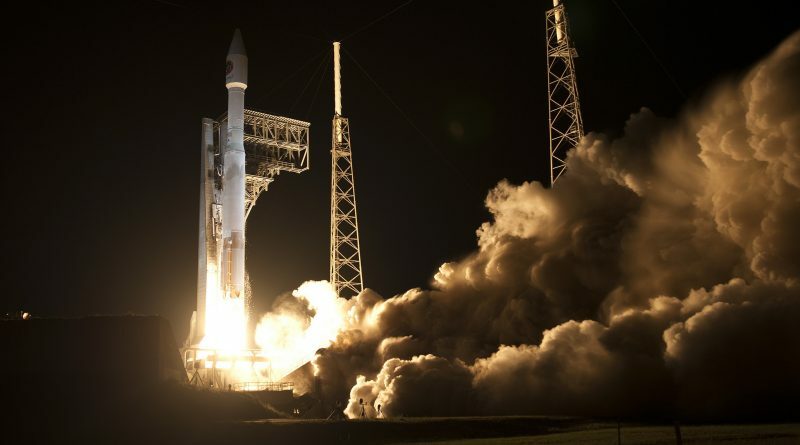 Atlas V began its climb into orbit at precisely 03:05:52.227 UTC on Wednesday, 11.05 p.m. local time at Florida’s Space Coast, lighting up the night skies with its Russian-built RD-180 engine. To reach the the 51.6-degree inclination ISS orbit, Atlas V flew to the north-east along the U.S. East Coast and was visible from a wide area before heading out over the Atlantic. 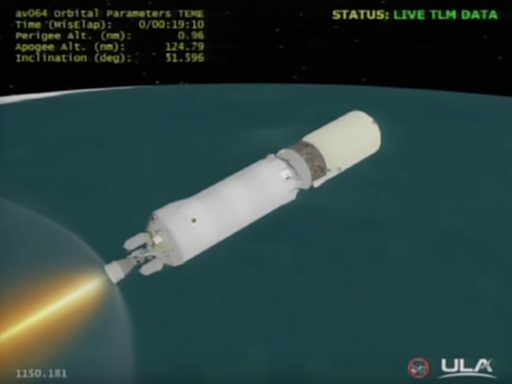 As a result, the Centaur Upper Stage had to extend its burn to make up for the performance shortfall of the first stage, ending up firing its 102-Kilonewton RL-10C engine for 14 minutes and 52 seconds, instead of the planned 13-minute and 45-second burn. The actual burn time of 892 seconds can be considered approximate and is based on the Live TLM Display provided during launch coverage. 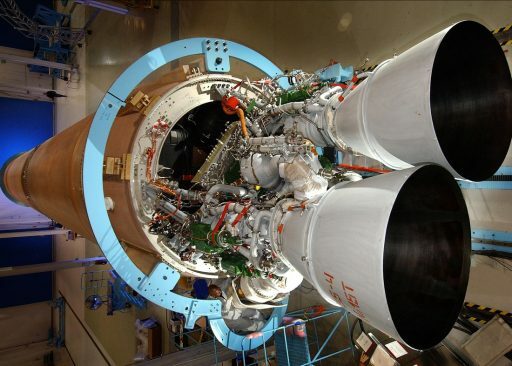 According to reports published after Atlas V’s performance shortfall became known, the cause for the early shutdown was the Common Core Booster running out of Liquid Oxygen, having operated the RD-180 in an oxidizer-rich setting for a significant part of its burn. The engine’s operation at a different mixture ratio will have had an effect on a number of parameters including engine temperatures, specific impulse and thrust output. 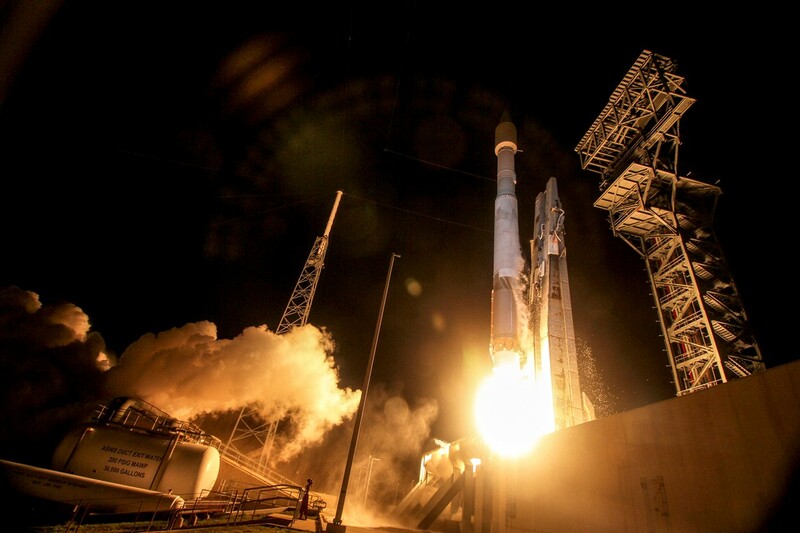 During the launch broadcast, Telemetry Engineer Marty Malinowski reported around 20 seconds into the flight that Propellant Utilization had been switched to closed-loop control, allowing Atlas V to adjust the oxidizer-to-fuel ratio delivered to the engine based on flight parameters such as performance and propellant quantity in the tanks to ensure an optimal consumption of propellants. 80 seconds after launch, Malinowski reported “seeing some minor mixture ratio requests” – possibly in response to the engine going into an oxidizer-rich condition. 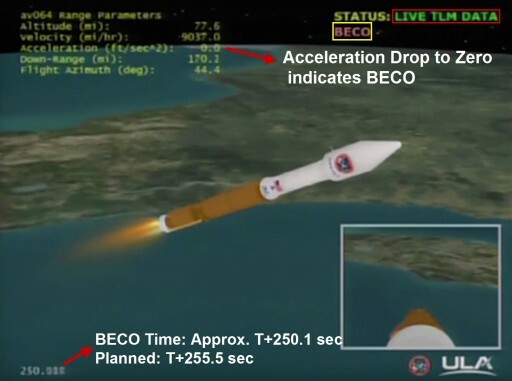 Booster Engine Cutoff (BECO) occurred 125 Kilometers in altitude, at a speed of 4.04 Kilometers per second. Given a ~5.8-second shortfall in burn time, the CCB dropped Centaur off around 175 meters per second slower than planned (based on a constant acceleration of 30.57m/s² as shown in the live data during the RD-180 throttle-segment at the end of the burn). The effect of the off-nominal mixture ratio on the performance of the CCB is hard to predict – the engine will deliver a higher thrust and lower specific impulse when oxidizer-rich, though unbalanced consumption of propellant may cause additional mass of RP-1 being carried to BECO making this an impossible calculation without an inside look at the data. Nevertheless, Centaur found itself in a scenario where corrective action was needed to save the mission. Luckily, Centaur has been able to dynamically adjust its flight profile for decades, computing the required burn duration and flight profile to achieve the target orbit. In this case, Centaur was in for quite a fight – heading into the target orbit was not as simple as adding 26 seconds of burn time to make up for the 175m/s performance hit. Centaur was faced with a number of other factors that increased the amount of delta-v (change in velocity) needed to achieve orbit – first and foremost were gravity losses arising from having to hold the rocket stage up in Earth’s gravitational field. When comparing Tuesday night’s launch with the flawless OA-4 mission in December (using an almost identical flight profile) it is evident that Centaur was holding a pitched-up attitude for much longer in Tuesday’s mission just to keep out of the atmosphere. Gravity loss is minimized when the pitch angle is small and the thrust-to-weight ratio is large – meaning when forward acceleration is maximal which is reflected in typical mission profiles comprised of a steep ascent to a low (but safe) perigee followed by a shallow pitch-angle burn to maximize the gain in horizontal velocity. Looking at Tuesday’s mission, Centaur pitched up considerably, simply to avoid dropping back into the atmosphere given its relatively low thrust of 101.8kN and heavy initial mass with full tanks and a heavy spacecraft. As Centaur lost mass by burning propellants, acceleration on the rocket stage increased and the pitch was lowered to allow the stage to build-up speed to eventually achieve orbital velocity and reach the desired orbital speed. In addition to gravity losses, Centaur also had to dynamically adjust its flight profile to meet the RAAN (Right Ascension of Ascending Node) requirements of the Cygnus spacecraft and its planned link-up with ISS. Centaur is well capable of RAAN steering, as advertised by the unique 30-minute launch window of a Cygnus mission riding into orbit on Atlas V owed to the vehicle’s ability to steer into the orbital plane of ISS if launching out of plane (early or late in the window). Given the burn extension of over a minute, Centaur had to go through additional steering to meet the desired RAAN, adding more delta-v needed by the vehicle. Centaur was tasked with a retrograde deorbit burn at T+48 minutes, firing its RL-10 engine to slow down sufficiently to re-enter the atmosphere over the Indian Ocean for an impact of any surviving parts in an identified zone south of Australia. 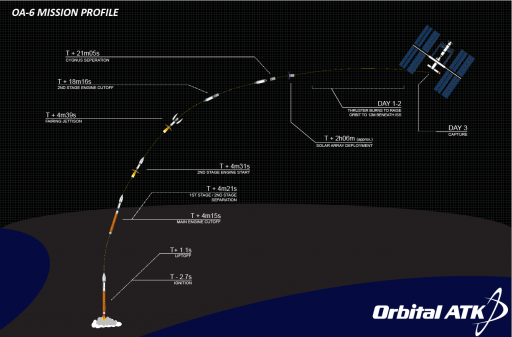 Vern Thorp, President for NASA Missions at ULA, stated prior to launch that the deorbit burn would be 11 seconds long. The duration of the burn and the placement of the maneuver and drop zone indicate a desired delta-v of the burn near 130m/s. This can be achieved by running the RL-10C near its 50% thrust setting, consuming approximately 130 kg of propellant. However, this burn assumed a vehicle mass of around 3,900 Kilograms (Centaur’s dry mass + leftover propellants after a nominal mission with a 13-minute & 45-second burn). In the best case scenario, Centaur had around 50kg of fuel available for consumption at the time of the deorbit burn. Given the 26-minute coast from spacecraft separation to D/O, the propellant mass at MECO was slightly higher due to cryogenic burn-off during the coast and a quantity of prop needed for RL-10 chilldown and pre-start. Boil off for a 26-minute coast will be on the order of 8kg for LOX and 3kg of LH2 . RL-10 pre-start needs 12.7kg of propellants. Assuming a propellant surplus of 75kg at the end of the 892-second burn gives this mission a margin of another 4.0 seconds of burn time at the thrust/acceleration setting seen in the closing seconds of the RL-10 burn (8.36m/s²), corresponding to a delta-v of 32.9m/s. So, had the Centaur needed another four seconds to compensate for the CCB performance issue, Cygnus would not have reached its intended orbit. Had Centaur needed another nine seconds on top of the 67-second burn extension, it would not have achieved orbit at all. Centaur had another 32.9m/s of delta-v in it at MECO, corresponding to a first stage burn time of 1.08 seconds. Luckily, margins turned out to be just right for Cygnus to enter its planned orbit. The only recalculations that had to be done by the Cygnus Mission Control Team were related to the one-minute later-than-planned separation time causing Cygnus to be released around 500 Kilometers further downrange. Cygnus made its delivery of 3,395 Kilograms of cargo on Saturday, arriving at the Space Station at 10:51 UTC when the spacecraft was grappled by the Station’s robotic arm for a two-month stay. 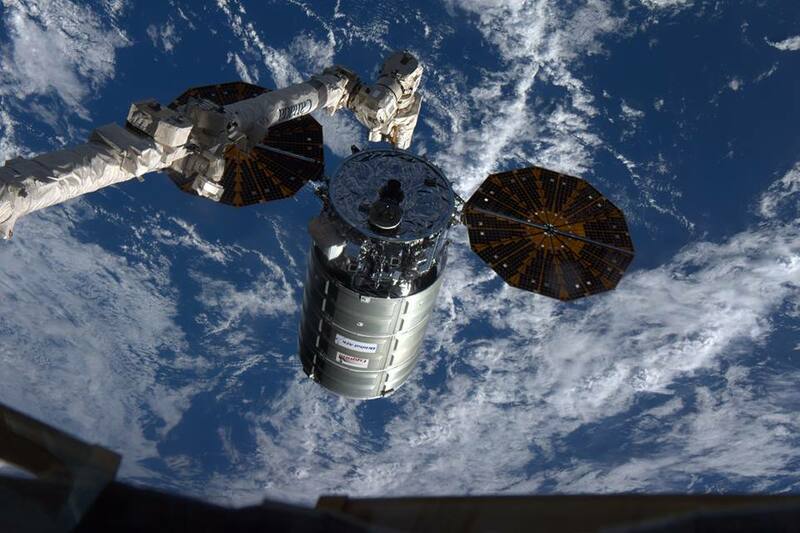 The hatch of the Cygnus spacecraft was opened Sunday morning and a busy crew in orbit already completed several hours of cargo transfer operations. : Acceleration at T+620 seconds was 7.52m/s² for Cygnus OA-4 in December and 6.31m/s² for OA-6 while both missions were to follow almost identical flight profiles. : The target insertion orbit for the Cygnus OA-6 mission was 229.8 x 230.0 Kilometers, inclined 51.6°. The achieved orbit, according to Centaur’s onboard navigation system was 229.8 x 230.2km and the first orbital elements issued by the Joint Space Operations Center showed the spacecraft in a 232 x 237-Kilometer orbit. 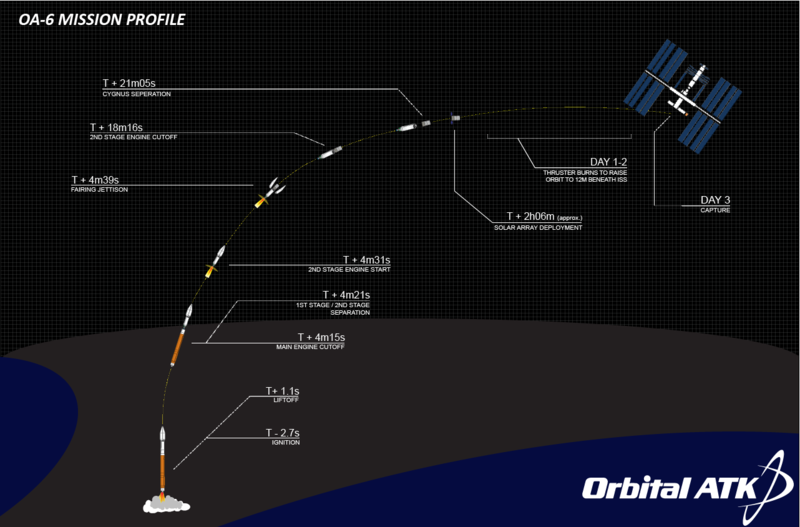 : Approximate Centaur delta-v estimated based on an average acceleration of 8.2m/s² during the RL-10 burn. : RL-10 Flowrate: 22.75kg/s. Different sources list 22 to 24kg/s flow rates for the RL-10C variant. 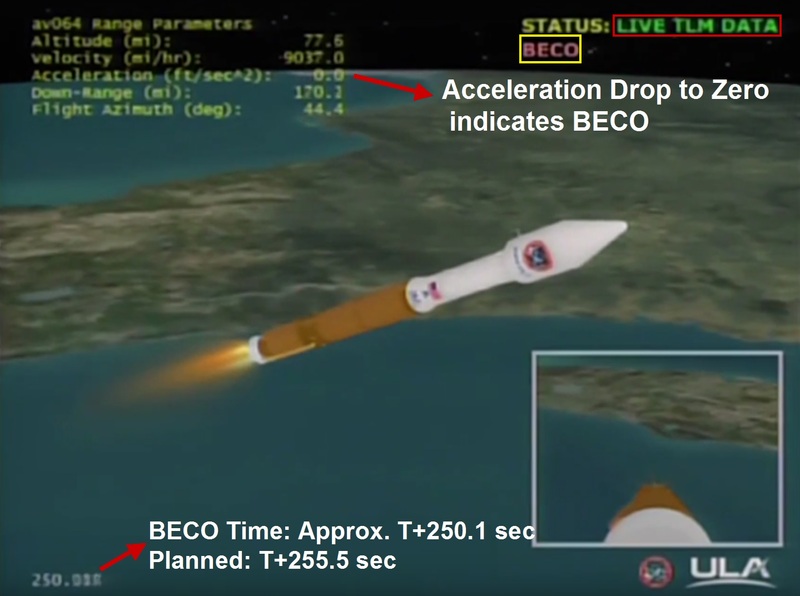 : How much propellant was available for the deorbit burn can be calculated but depends on how Centaur is programmed to conduct its burn – whether it uses a fixed thrust setting until the desired delta-v is reached, tracks the dV increment as a function of time, or whether it tracks its acceleration and dynamically adjusts the engine thrust to maintain a given acceleration. This is important because Centaur, when making the deorbit burn, did not have the mass used in pre-launch predictions (having burned some 1,500kg during the 67-second burn extension not accounted for in mission planning). In case of Centaur using a fixed thrust setting computed for a ~3,900-Kilogram vehicle mass, the three-second deorbit burn of the ~2,275kg craft would have slowed Centaur by 66.7 meters per second consuming around 50kg of propellant. With Centaur sticking to an acceleration of 12.7m/s² based on the given burn time and estimated planned delta-v, Centaur would have been forced to throttle down to 28% – a thrust setting not normally in RL-10’s repertoire, though demonstrated in early RL-10A testing to be achievable without instability. In this case, Centaur would burn even less propellant in three seconds and achieve a delta-v of only 39m/s – barely sufficient to drop the stage out of orbit (Perigee lowered to 99 Kilometers). In the NASA TV Broadcast, Centaur was reported to be in the process of deorbiting at T+75 minutes, around five minutes later than the debris splashdown time given ahead of the mission. This would place re-entry south east of New Zealand, around 4,000 Kilometers from the center of the identified box south of Australia. : Propellant Boil-Off calculated based on: “Centaur Upperstage Applicability for Several-Day Mission Durations with Minor Insulation Modifications”, published by ULA in 2007.
: Pre-Start propellant flow based on RL-10A, start-up sequence unchanged for RL-10C. Calculations presented on this page can be considered illustrative to showcase how fine the line between failure and mission success was – data presented here is based on estimates, therefore the error bar may well be quite significant.